MARTHA SLAYTON, Homeroom Treasurer 2; Gamma Tri-Hi-Y 4; GAA 2, 3, 4; Library Assistant 2; Central Attendance Assistant 4. Martha Slayton Drum, 46, an orthodontic technician and a former member of the Northern Virginia Dental Assistants Society, died of cancer September 14, 1988 at her home in Alexandria. Mrs. Drum was born in Newport, Vermont, and reared in Arlington, Virginia. 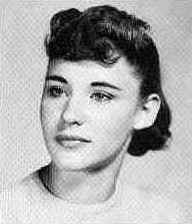 She graduated from Wakefield High School in 1960. A certified dental technician of the American Dental Assistants Association, she received her professional training from various orthodontists in the Washington area. From 1960 to 1967 she was an assistant to Dr. George Tunstell. Since then she had worked for Dr. Brendan Stack in Vienna. Survivors include her husband, Dr. Roland H. Drum of Alexandria, Virginia, an orthodontist; her mother, Margaret T. Slayton, also of Alexandria, and a brother, Dr. Michael E. Slayton, a physician of Blacksburg, Virginia.